Interestingly, it was only recently noticed by the rest of the world and hailed as a “superfood” due to its high nutritional content. This article takes a look at what quinoa is, where it comes from and why it’s so good for you. Botanically speaking, it’s not a grain. However, it’s often called a “pseudograin” because it’s similar in nutrients and eaten the same way as cereal grains (1). Quinoa was first grown for food 7,000 years ago in the Andes. The Incas called it “the mother grain” and believed it was sacred (2). Although it’s now grown around the world, the majority is still produced in Bolivia and Peru. It was largely unknown to the rest of the world until very recently (1). In fact, the year 2013 was named “The International Year of Quinoa” by the UN because of its valuable qualities and potential to fight world hunger. Quinoa is also popular because it’s a gluten-free grain. This means people with celiac disease, wheat allergies or those who avoid gluten can consume it. There are over 3,000 varieties of quinoa (2). 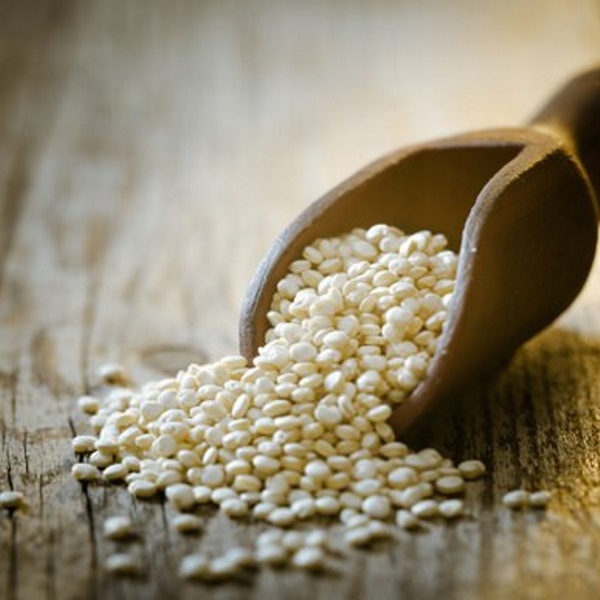 White quinoa is the most commonly consumed variety, and is what you’ll usually find at the store. Interestingly, the different types also have varying nutrient contents. A study examining red, black and white quinoa found that while black quinoa has the lowest fat content, it has the highest omega-3 fatty acid and carotenoid contents (3). This grain is also popular because it’s very nutritious. It’s packed with vitamins and minerals and contains more protein, fiber and healthy fats than other grains. While it’s possible to get all of the essential amino acids from a plant-based diet, it does require eating a variety of plant-based proteins. Quinoa is very high in beneficial plant compounds. Some examples are saponins, phenolic acids, flavonoids and betacyanins (6). One study examined 10 types of grain from Peru. It found that quinoa had an antioxidant capacity of 86%, which was higher than all the other grains analyzed (7). While all varieties of quinoa are high in antioxidants, the darkest seeds contain the highest amounts. This means black quinoa contains more antioxidants than white (3). Nonetheless, one study found that consuming 25 grams (just under 1 oz) of quinoa daily increased levels of the important antioxidant glutathione by 7% (9). Several studies have linked whole grain intake to a reduced risk of type 2 diabetes and improved blood sugar control (10). One large review found that consuming just 16 grams of fiber from whole grains per day was linked to a 33% lower risk of developing type 2 diabetes (10). However, there aren’t many studies on the specific health effects of quinoa. Nonetheless, one rat study found that it could reverse some negative effects of a high-fructose diet, including high blood sugar (11). This could be because it contains phytoecdysteroids, which have been shown to lower blood sugar in mice (12). It also appears to contain compounds that inhibit alpha-glucosidase, one of the enzymes involved in digesting carbs. This could delay the breakdown of carbs, causing a slower release of glucose into the blood stream (13). Quinoa’s high fiber and protein content may also contribute to its positive effects on blood sugar. However, it is a grain and is still relatively high in carbs (7). One study found that eating 50 grams (1.7 oz) daily for 6 weeks lowered total cholesterol, triglycerides and LDL cholesterol (14). However, the effects were small, and it lowered the levels of the “good” HDL cholesterol too. Another study compared quinoa and corn flakes. It found that only quinoa significantly reduced triglycerides, total cholesterol and LDL cholesterol (9). Chronic inflammation is involved in a wide range of diseases, from type 2 diabetes to cancer and heart disease (15). Although studies have not shown consistent results, a diet high in antioxidants is thought to help fight inflammation in the body (15). Saponins are one of the plant compounds found in quinoa. They give it a bitter taste, and some people rinse or soak quinoa to try and remove this taste (16). One study found that saponins could inhibit the production of pro-inflammatory compounds by 25–90% in isolated cells (16). Phytic acid is found in a range of foods, including nuts, seeds and grains (17). It’s particularly great for vegans, vegetarians and people on a gluten-free diet.